Welcome to the Girlz Gone Riding family! 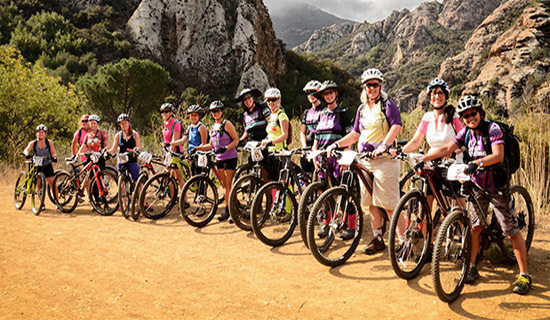 GGR is a group of women mountain bikers of all ages and skill levels in Southern California and Arizona. Our mission is to get more women mountain biking and to ensure they have a great experience every ride! During the year, GGR schedules monthly rides, skill & bike maintenance clinics as well as destination rides such as Big Bear, Mammoth, Kernville, MT. Pinos and GMR. Great attitudes and helmets are required on all rides. Two way radios are highly suggested: tuned into station 5.25. Bring your enthusiasm and pearly whites because we have a great time and take TONS of photos! Our facebook pages are where you will learn about local rides, races, events, road trips, injury reports, and items for sale. You can also find other women to ride with in your area at your skill and endurance level. "We ride cross country, all mountain and down hill. We are a positive and supportive women's group for all levels of riding. GGR is an alternative to co-ed riding with all rides being no drop rides."